Is John Goodman's New Myst PC CD-ROM Worthy of the Original Game? Sound the gong, close the curtain, and cue up the fat lady... for those who still had any shred of a doubt after King Ralph, it's now official: John Goodman's career is over. Way over. Pyst is a recently released parody of Myst, the all-time best-selling CD-ROM game. At least the packaging refers to it as parody. Perhaps a better description would have been "weak, pathetic attempt to capitalize on a popular game." Actually, even "attempt" overdignifies the work of the disc's producers, implying that some effort was actually put into this one -- not a likely scenario. Goodman stars in Pyst as King Mattruss, a takeoff on Myst's King Atrus (evidently, the game's creators saw Goodman loitering around their office with his "Will act for food" sign, and figured, "Hey, what do we have to lose?"). 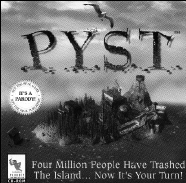 The game's premise is that four million players have trashed Pyst Island, and now it's your turn to explore. Pyst is not actually a game. Rather, it's a simple walk-through of still shots of the island. Ten of these digital postcards constitute the disc in its entirety. If you have the patience to click on everything in every picture, the disc will keep you occupied for about an hour before you toss it into the microwave. But what excitement awaits on these snapshots? Here's a sample of the first one: Fade in to an unanimated, amateurish screen resembling an area of Myst Island. Click on lights. They light up. Click on sea gull. Sea gull takes a dump, complete with sound effects. (No, I'm not joking... I only wish I were.) The other nine scenes are about as exciting, with fourth-grade scatological humor providing the major highlights of the adventure. As for Goodman, his role consists of sixty seconds of on-screen acting as well as lead vocals on the disc's audio theme (which you can play in your audio CD player too!). The song, brilliantly entitled "I'm Pyst!" is of about the same quality as the rest of the disc. The only other parts of Pyst are a video on the making of Pyst and access to a members-only area of the Pyst Web site (http://www.pyst.com), both of which are remarkably unremarkable. Myst, the title that single-handedly helped spawn the CD-ROM industry, was a great success because it sucked gamers into new worlds full of adventure. Pyst, on the other hand, just plain sucked. To draw on an analogy from City Slickers, if sucking were people, Pyst would be China.